5/12 Cup of Coffee: Strong pitching was a common theme across all of the affiliates on Wednesday. Pawtucket squeezed out a win while Portland wasted a stellar start from Aaron Wilkerson (pictured). Also, Salem stayed hot with a come-from-behind victory over Lynchburg. In his second rehab appearance, Joe Kelly went five innings and threw 77 pitches (48 strikes). He picked up the win, allowing just one run on five hits and a walk while striking out three. Anthony Varvaro and Pat Light each added two scoreless innings of relief, with Light picking up his first save of 2016. The PawSox got all their offense in the fourth on a two-run home run by Blake Swihart. Sam Travis and Chris Marrero each had two hits in the victory. A late rally propelled the Fisher Cats to their first home sweep of the Sea Dogs since 2013. Aaron Wilkerson hurled six scoreless innings for Portland, allowing just four hits and three walks while striking out five. The 26-year-old right-hander has a 1.69 ERA in six starts this season. Luis Ysla took the loss; he allowed two runs on three hits and a walk while striking out four in two innings of relief. Portland's lone run came in the fourth on a Tim Roberson RBI single. Portland dropped to 10-23 on the year and is 13.5 games back of first-place Hartford. A five-run eighth inning pushed the Red Sox past the Hillcats. Trey Ball started for Salem and allowed three runs on four hits and four walks over six innings. Mario Alcantara picked up his third victory of the season, twirling two scoreless innings of relief. Austin Maddox pitched a scoreless ninth to record his fifth save. Down, 3-0, in the fifth, Salem got on the scoreboard on a Deiner Lopez solo home run. In the eighth, the Red Sox got RBI singles from Andrew Benintendi, Rafael Devers, and Danny Mars. Mike Meyers provided insurance with a two-run triple. Salem now has a 23-9 record and is 6.5 games ahead of second-place Myrtle Beach. Player of the Night: Aaron Wilkerson, who received a no decision in Portland's 2-1 loss to New Hampshire, earned the honors. Wilkerson tossed six scoreless innings, allowing just four hits and three walks while punching out five. 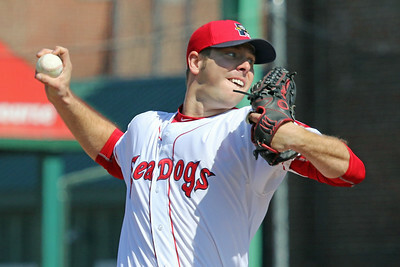 Wilkerson has compiled a 1.69 ERA in six starts for the Sea Dogs and has struck out 38 in 32 innings pitched.